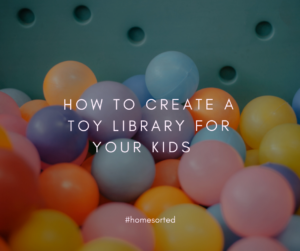 How to Create A Toy Library for Your Kids - Home Sorted! Do you find yourself struggling with the number of toys your kids own? Perhaps your family room looks more like a toy shop? If you’re nodding along yes, please know, you’re not alone! More so, we’ve got the perfect solution to all of your problems – a toy library! Toy libraries are a fun and creative way to organise your kids’ toys – they also serve to teach your kids a few lessons along the way. In short, a toy library is a system where your kids check out new toys each day to play with. The first step of creating a toy library is to choose an area of your home to become the toy library. In order for this to work you also need to have some sort of toy storage available – a place where you can store your kids entire toy collection. Bookshelves are a good option as they keep toys on display, you can also choose to use a toy box or large storage containers. Toy libraries function with a few simple rules, as outlined below. It may take some time for your kids to adapt to the new system – but it’s important to stay strong and ride out any teething issues that may arise. •	Keep all toys in the one area – no exception! As we mentioned earlier there may be a few teething issues along the way. It’s common for kids to be unhappy at having their toy selection limited – but how often do they pick something up, play with it for five minutes and discard it every day? Too often if you ask us! Toy libraries allow your children to learn valuable decision-making lessons, along with resilience to handle the fallout of any poor choices they make. Are you keen to try the toy library system? We definitely think you should!